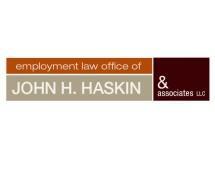 At the Employment Law Office of John H. Haskin & Associates, LLC, in Indianapolis, Indiana, we focus our practice exclusively on employment law, and we are fully committed to helping you resolve your conflicts with your employer and achieve the full and fair restitution you deserve for the serious and pressing legal challenges related to your job. We understand how important your job is to you and your family, and we also understand the stress and anxiety you are likely feeling regarding your situation. This is why we promise to sit with you and discuss your options and then devise the most effective strategy to help you obtain the favorable outcomes you expect and deserve as efficiently as possible. Over the course of our history, we have helped thousands of good people across our state, and we can help you too. For more information, you can contact the Employment Law Office of John H. Haskin & Associates, LLC, by calling our office or visiting our website to schedule a free initial telephone consultation.